An evil wizard has placed the Great Dragon, the protector of the realm, into a stony slumber, its fiery breath locked away in a ruby jewel called the Dragonheart. With the lands guardian imprisoned, trolls and fire dragons run amuck, barely held in check by brave knights and canny huntresses. 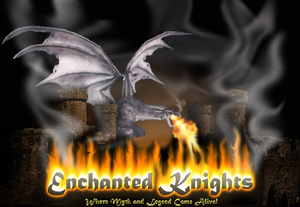 Meanwhile, enigmatic sorceresses tap the magic of the Dragonheart to their own ends. If you can bring order to these factions before your opponent does, you will control the fate the Great Dragon... and the realm itself. 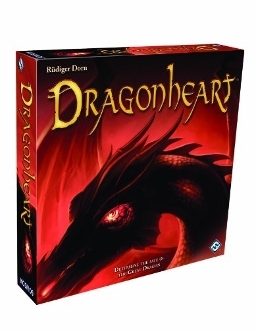 Dragonheart is a quick and easy-to-learn card game for two players, playable in only 20 minutes. Players try to accumulate points by playing cards to and collecting cards from the game board. The player with the most points at the end of the game determines the fate of the Great Dragon, and the land itself. Recommended for ages 8 and up.